Lizzy and I spent the evening making this gingerbread house log cabin. They have a gingerbread display at school, and of course tomorrow is the deadline. I wouldn’t want to take my time, plan, that would be too easy. We started with a kit and embellished (and embellished and embellished). I need to remind myself (often) that ‘less is more’. OH WELL! We built the chimney out of Honey Maid Graham Crackers and white chocolate, the bricks are Nabisco Shreddies and just like last year our roof shingles are Frosted Mini Wheats. Are you making a gingerbread house this year? If you have … share a photo with us (leave the a link in the comments or email it to me and I’ll share it for you). Fantastic job. Lizzy is sure to win the contest. @Gayle Broks, Thanks! She is keeping her fingers x’d. Oh. my. you always come up with the cutest stuff. This is no exception. I definitely won’t be attempting gingerbread houses this year. Levi would just eat everything before we put it together. Maybe next year. .-= Madeline´s last blog ..Thank You =-. @Madeline, Thanks! No gingerbread houses for Levi (yet), he’d probably want to sleep with it!! Ha! Ain’t that the truth! .-= Angella´s last blog ..Lucky Number 7(D) =-. I know that I have said this to you on many occasions (to your face, too) DANG, but I covet your camera. Oh, and your kitchen skillz. Aaaaand, well, will you adopt me? .-= Liz@thisfullhouse´s last blog ..The Littlest Elf That Could, Fo’Shizzle! =-. @Liz@thisfullhouse, Yes, I’d love to adopt you. I don’t understand http://nikon.com … you really need to give Liz a D90 (even a D40) for her fabulous blog! With someone like me as a brother the house wouldn’t make it until morning. Mmm it looks delicious! And I love the set-up of the photos…the Christmas tree light bokeh in the background is fab! RE: your comment: Yeah, the colors of the yarn aren’t quite as bright IRL as in the second pic, but I agree with you — I like the second pic better! .-= ashpags´s last blog ..Lens Love =-. MK and Lizzie: Nice work. I’d personally start with eating the roof. No kidlets in our house so no house building for us…off to wrap some presents. @Nikki, Thanks Nik! I’m not crazy about any of the candy. I do like mini-wheats though. .-= Amy J in SC´s last blog ..Carrieâ€™s Christmas Cookies =-. @Amy J in SC, I liked the bokeh too. My part of the world is terrible for light at this time of the year. At least we can enjoy the Christmas light bokeh! Wow, that looks amazing! Looks too good to eat. .-= Chris | Dads Advice´s last blog ..Dad Advice: Baby Necessities =-. @Chris | Dads Advice, Thanks! The kids are dying to dig into it. I am happy we had to send it to school for the display. Too cute!! Are the logs Pirolines? Looks fantastic. That is a great gingerbread house. My daughter is a little too young for that activity (18 months) and I can’t wait to be able to do it. .-= Sheri´s last blog ..Zen Baby DVD Winner =-. @Sheri, Thanks and happy holidays to you too! Ok … this gingerbread house … coupled with your Marie Antoinette Halloween costume SOOOO qualifies you for Mother-of-the-Year. You have my vote! 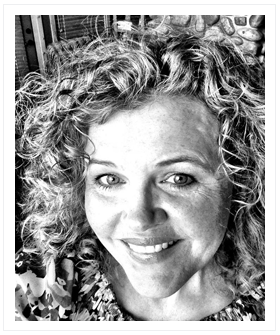 .-= Jodi Renshaw´s last blog ..Please Help Make My Christmas Wish Come True. =-. @Jodi Renshaw, I am far from MOTY … FAR FAR FAR! You haven’t seen my laundry room. The mess around here is gross. That is sooo cute. I’ve done a brownstone with chocolate grahm crackers before, but this is adorable. I want to make this when my stepdaughter is in town for Christmas. The baby is just too young to enjoy it. @Julie @ littlefornow, Thank you. I’m glad you stopped by. I really wanted to buy a gingerbread house kit but they are kind of hard to find here, I’ve only seen them in a couple of stores (probably because it’s traditionally a North American thing to do at Christmas time). I could make my own gingerbread, I suppose!!! .-= Hannah´s last blog ..Thoughts =-. @Hannah, Thank you! They are really inexpensive here, just $9. You house came out nice. Love the twinkling lights in the back. .-= Carey´s last blog ..YoPlus Light yogurt Giveaway =-. @Alina, Thanks! I love your website and photography. Everyone should head over to your blog http://russianseason.net and check it out. .-= Amber’s Crazy Bloggin’ Canuck´s last blog ..Happy Birthday to the Lord of the Gourds! =-. @Sarah Mae, The logs are Rondoletti cafe style cream wafers. I bought them at Safeway. Now THAT’S a gingerbread house!!! Beautiful! 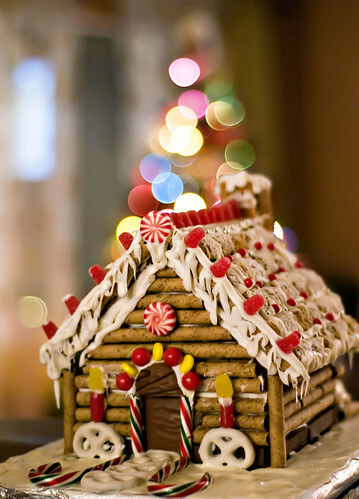 Hey – i like the way they did the log walls on the gingerbread house. My family makes they every year and they can get pretty elaborate. But no one in my clan had thought of that type of outer wall. What is nice is to get coconut and mix it with the icing sugar and make snow men. What is also nice is to put a bit of blue colour into watery icing sugar and make a skating rink out site the house and to stack up pieces of pretzel to make a fire. Well looking at that just makes me feel so inadequate! I am utterly useless in the creative department so I totally take my hat off to you. My kids are always embarrassed by my efforts. My ‘snowscene’ christmas cake is the stuff of legend. The acai berry serves as the very best complete body cleansing and detoxifying agent available, even promoting increased bodily energy levels as it purifies. Now thats very cute its looking great on cards for at lest now. You and you’re kid is so creative.Gingerbread log cabin is beautiful. Super-Duper web site! I am loving it!!?! Will come back once more – taking you feeds also, Thanks. Yes, that was my question! Cinnamon sticks? Not cinnamon sticks but Rondolettie cafe style cookies. I bought them in Safeway. 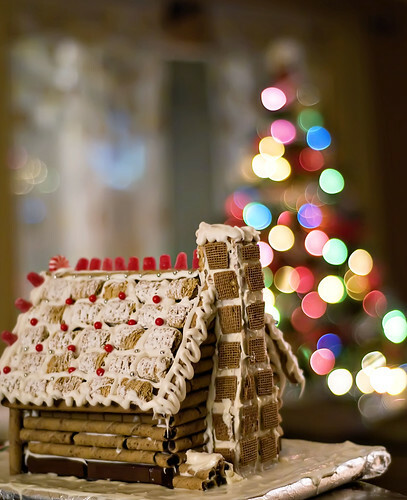 I love the photos of the ginger bread house. Great photos! The best part about gingerbread houses is when you come home from a hard days work at the end of the day, your gingerbread house’s bathroom doesn’t need renovating, or the kitchen cupboard door isn’t hanging off – All you need to do is bite it with a hot cup of coffee! Christopher, who is six, and I, his ‘Muu-maw’, went to a small county library where they allowed us, for only $3.00, to create our own gingerbread houses. Saturday we decorated and ‘glued’ the walls to a small sheetboard, and Sunday afternoon we decorated and ‘glued’ on the roof and chimney. We had such a wonderful time.